DURANGO, Mexico (Reuters) - At least 65 U.S. citizens were aboard the Aeromexico passenger jet that crashed in northern Mexico, a U.S. official said on Wednesday, as investigators combed the wreckage for clues to the cause of the accident. The U.S. consulate general in Monterrey and the U.S. embassy in Mexico City have been in touch with local and federal officials in Mexico and with the airline, an embassy spokesman said. Nearly everyone on the flight suffered minor injuries, Mexican officials said. Luis Gerardo Fonseca, director of Mexico's civil aviation agency, told local news media on Wednesday that the plane's flight recorders had been found. Commercial aircraft carry a cockpit voice recorder and a flight data recorder, commonly known as "black boxes," which can contain crucial details of the last minutes of a flight before an accident. Video purportedly of the crash recorded from a plane window showed a dark sky and fog and the ground still visible moments before a thud and shrieking passengers were heard. Reuters could not independently verify the video. "The impact was very strong. We wanted to think it was a lightening strike," said Chicago resident and passenger Lorenzo Nunez. "It was terrible, absolutely terrible." Nunez said he had been visiting family in Durango. A time-lapse video posted by Webcams of Mexico, filmed during the hour before the crash, showed dark clouds and fog or rain moving in. Officials said it was too early to say what caused the crash of flight number 2431. Aeromexico said in a Wednesday morning Twitter post that 64 people had been released from hospitals. Two people were more seriously injured, including the pilot and a minor, the state health department said. 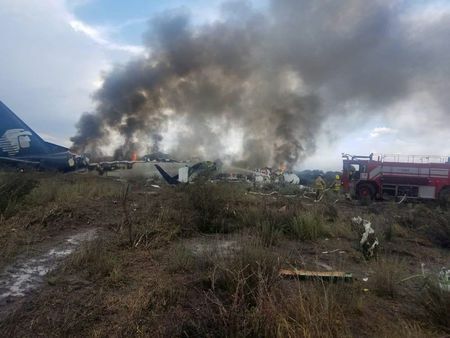 Fonseca told broadcaster ADN40 that his team began working at the crash site around 7 a.m. local time (1200 GMT), along with representatives of the U.S. National Transportation Safety Board (NTSB) and U.S. Federal Aviation Administration (FAA). Representatives of Embraer SA and the maker of the plane's engines, General Electric Co, were also assisting, Fonseca said. It can take safety investigators months to piece together the complex chain of events leading to an accident. Under international rules, Mexico will lead the investigation with support from Brazil, where the Embraer jet was designed and built, and from the United States, where General Electric Co made the CF34-10E engines. Aeromexico leased the 10-year-old aircraft involved in Tuesday's incident from Republic Airlines in the United States in 2014, according to data on Planespotters.net. A spokesman for Republic Airlines said on Wednesday that the company briefly leased the plane to Aeromexico, but the aircraft was sold to a third party in 2015. The airline did not give the name of the third party. 0 Response to "Most passengers in non-fatal Mexican plane crash were U.S. citizens"